Zack Lightman is daydreaming through another dull math class when the hightech dropship lands in his school’s courtyard–and when the men in the dark suits and sunglasses leap out of the ship and start calling his name, he’s sure he’s still dreaming. But the dream is all too real; the people of earth need him. As Zack soon discovers, the videogame he’s been playing obsessively for years isn’t just a game; it’s part of a massive, top-secret government training program, designed to teach gamers the skills they’ll need to defend earth from a possible alien invasion. And now . . . that invasion is coming. 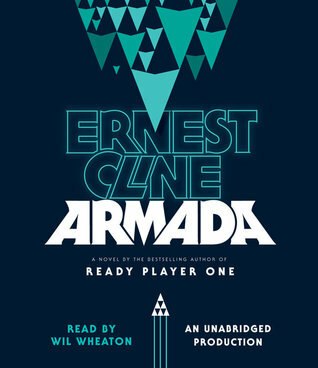 This was a fun read with loads of 80s and 90s pop cultural references–movies, television, books, and videogames–most of it sci-fi and perfect for the geek in me. Plus lots of music references and tunes from the past that are now playing in my head. The plot revolves around a government conspiracy. Secretly, they have been training young people to fight an upcoming alien invasion using video games, and the technology we think of as science fiction actually exists. Think of it as The Last Star Fighter meets Ender’s Game, plus a little Galaxy Quest. I am not the first reviewer to mention this, and the author himself makes many, many references to sci-fi movies. And that’s part of the fun. The pace is fast, there is lots of action, and the cultural references kept me laughing and nodding and thinking this was so impossible and yet so entertaining. And at the same time wondering, what if this were true? This is the stuff the X-Files was made of. As much as I enjoyed the story, at times it got bogged down in the video game descriptions. I enjoy an occasional video games, I still do, but I never got into the war strategy games; instead I played the single shooter types like Wolfenstein 3D and Cosmo’s Cosmic Adventure. Yes, I’m old. One doesn’t need to be a science fiction fan, geek, or gamer to enjoy this book. The same goes for Cline’s first book, Ready Player One, an all-time favorite of mine. The narration was performed by Wil Wheaton. He made the book and the characters come alive. The pacing, the action, the voices–just perfect. I don’t think I would have enjoyed this as much in print. The combination of a superb narrator and a story that is easy to follow (a linear storyline that takes place in one day in the near future) makes audio a good choice for listeners of all levels. I bought this in print last week – I can’t wait to read it! Sounds like a fantastic audiobook! Some people were disappointed with this book. Glad you liked it as much as Ready Player One. I loved that book, also one of my favorites. Must read Armada!